In the follow-up school holiday activity, ‘Big Box Battle’, another time portal presented a rather bigger challenge. Our young heroes found themselves wrestling Godzilla-like monsters in a knee-high cardboard city. Like our live action teen zombie roleplays, which you can see news coverage of here, this was a chance for kids to physically enter the world of an adventure story. Big Box Battle found inspiration in the Hollywood movie Pacific Rim. Last time on the blog, I was saying how important it is for libraries to accelerate and match pace with trends in popular culture: this is why we’ve gone from zombies in 2012 to steampunk in September 2013 and now monsters-versus-Godzilla battles just two months after Gulliermo del Toro’s kaiju-battling blockbuster. Once again, this was a mixed age range activity, with participants ranging from seven years old to seventeen. Parkes librarians saw the power of that in our 2012 zombie event. In such sessions, the 17-year-olds keep the younger ones’ behaviour restrained, while the pre-teens help the older ones to suspend disbelief. Big Box Battle began with a two-day monster making workshop for local teens. They came to hang out, watch cheesy monster movie trailers, and play their music loud while making bits of art and choreographing their monster battles. Some of the designs drew on local traditions of rustbelt art – such as the “Waste to Art” Elvis who poses on a Parkes roadside, taking a chainsaw to a logpile. In our teens’ hands, he became a sinister robot, “Chainsaw Elvis”, who allied with villains ranging from a Dalek and Godzilla to a walking Vegemite jar which taunted its enemies to sound of Men at Work’s Down Under. 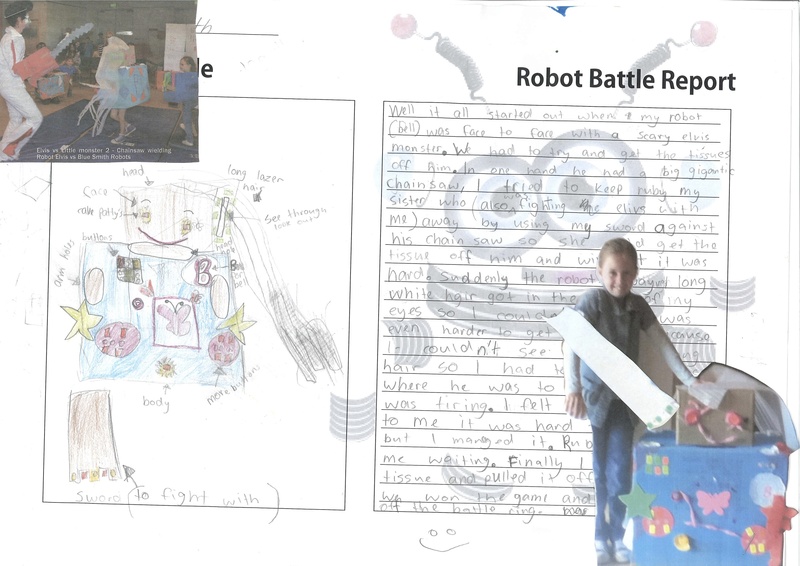 When the monsters were complete, we invited under-12s to make robots which could battle the teens’ monsters. The robots were designed and described on a form, with space for them to assign various stats to their character – we showed them Transformers Top Trumps for inspiration. 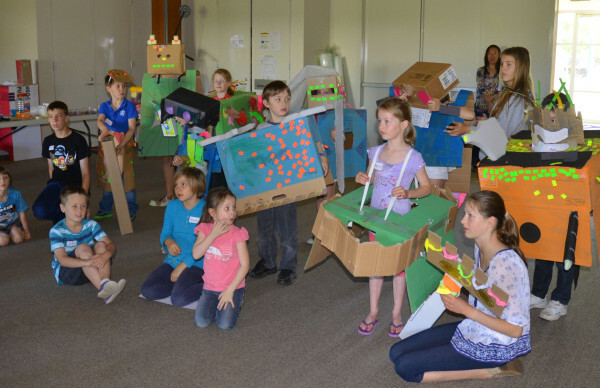 Cardboard boxes formed the robots’ bodies, and then the kids were able to use craft materials and recycled items to decorate and enhance their character. After lunch came the battle itself! The activity was partly inspired by Kaiju Big Battel – a daft parody of costumed wrestling which sees ludicrous monsters tussle in a mocked-up cityscape. I was MC for the event, hyping up the crowd, introducing the warriors, and providing commentary on the battles. Teens had chosen entry songs for the monsters and created back stories for each character. For example, ‘Bubble Wrap Man’ (a limbless character swaddled from head to toe in packaging material) had a vengeful older sister, ‘The Final Zepp’, who looked like the Saw films’ Jigsaw puppet but with a binbag body. (This particular character highlighted the extent to which fear is culturally determined – our teens felt The Final Zepp was their creepiest invention but the little kids, thankfully unaware of the Saw films, were unmoved by her spooky mask!). Obviously you think about health and safety when running these activities. We were very mindful of the risks in allowing kids to wrestle in a library – but at the same time we weren’t going to cop out on the idea of a “big box battle” and immersion in a world of boisterous physical play. We wanted something on the level of a pillow fight – playful, fun, and relatively safe – and hit on the idea of every robot and monster having two large tissues attached to their costume – when both had been torn off, the player was out of the game. We also assigned two referees to control the playing area and set strict expectations around safe play in the “ring”, formed by gym mats loaned from the local high school. Big Box Battle was a huge success, enjoyed by both the kids, teens, and the parents who came as an audience. There’s something about having a tiny child hug your knees, thanking you vociferously for the monster battle, which makes you feel like you’ve done a good job. It’s not every day that a 7-year-old gets to trounce a chainsaw-wielding 17-year-old on the streets of a cardboard city. The fun didn’t stop there, either: as an additional literacy follow up, we created a prize draw for kids who wrote and illustrated their monster adventure and submitted their story to the library; an opportunity for the warriors to use their words as well as their craft and fighting skills. Over the course of the 2-part activity incorporating Time Travel Detectives and Big Box Battle, we had brought together school and holiday activities, using an exciting mystery to encourage even reluctant students to visit the library on their own time; we had developed reading, writing, and craft skills, and modelled safe, fun play in a community environment. Local kids and teens had worked together. Shy kids had been able to step into the limelight, fight evil, and then receive the applause of their friends and family. But at the heart of this activity lay simple fun – really nothing more than play. When library managers argue about quantitative versus qualitative metrics – so important when we need to balance proof that our service is relevant with avoidance of emphasis on loans and footfall – it’s great to have an event like this to remind you that a big part of library work is putting a big grin on people’s faces…and that imaginative play is also the business of libraries.